Chuck Cassar, president of CJD, LLC, repair and manufacturing services, is a 45+ year veteran of jewelry manufacturing, merchandising and product development, having worked for QVC, Best Products and Zales Corp. Chuck presides over his the USA based CJD services while heading all the international components of DGLA-India operations. David Atlas, president of D. Atlas & Co., Inc., is a third generation, 45+ year veteran. He serves as chief gemological consultant to DGLA-USA and supervises all USA diamond certification and jewelry appraisals. 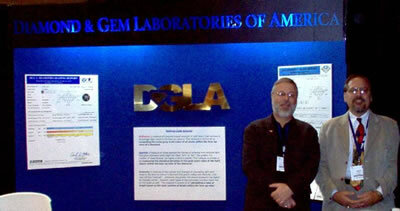 David is chief consultant on gemology and ethical practices for the DGLA India operation through Chuck Cassar. Mr. Atlas is an Associate Director, Senior Member and Chairman of the Ethical Issues Committee of the National Association of Jewelry Appraisers. Amongst his numerous accomplishments, David has pioneered techniques for the cut grading of round and fancy shaped diamonds.